I have an online list that has a lots of columns. Columns A,B,C and D are in date format. 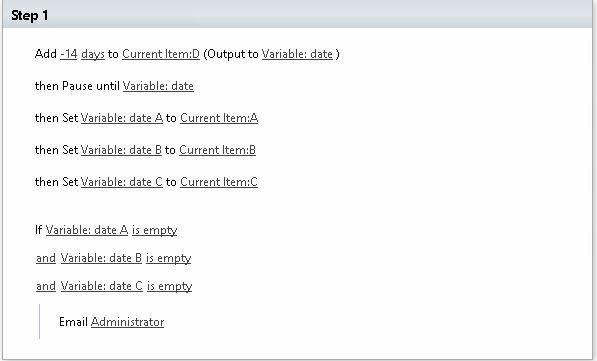 Date in column D is always populated, but dates that are in A, B and C should be entered later on, before the date in D. I need a workflow that sends out an e-mail if dates are in A, B and C are not populated two weeks before the date in D. If any of columns of A, B and C are empty e-mail should let person know that date in D is approaching. I use SharePoint 365. Thank you in advance. 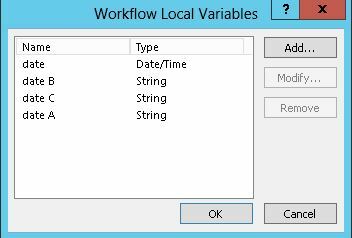 Use the “set workflow available” action to check if the date column is empty using “string” type. Not the answer you're looking for? Browse other questions tagged sharepoint-online workflow email notifications sharepoint-designer-workflow or ask your own question. How do you generate an email based off data in in an excel column?